"I Want To See A Rise In The Number Of Millionaire Housewives And Financially Supportive Stay-At-Home Mums"
It is no longer news that we are in economically desperate times and like it is wisely said, desperate times call for desperate measures. Since the economy of the society is reflective of the economy of the family, it goes without saying that a poor family is a poor society. After all, charity begins at home. Now, you will agree with me that when the word 'family' is under any form of debate, the role of a mother cannot be over-emphasized. It is for this fact and my desire for a financially healthy family that I do this. You want to read the following lines carefully if you are a woman who is willing and ready to change her story financially. Are you desirous of becoming financially independent, able to buy what you want, when you want it, with your own money without having to beg any other person for it? Would you like to be able to have the freedom to take your own correct decisions for the good of your family as at when necessary? Do you want to be able to command respect in your own home and husband's family because you have the means to provide for yourself and your dependents? If your answer to any of these questions is, “Yes", "Yes oh", "Hmnn" or "I want this badly”, come closer as this will be the best message you will ever read today. 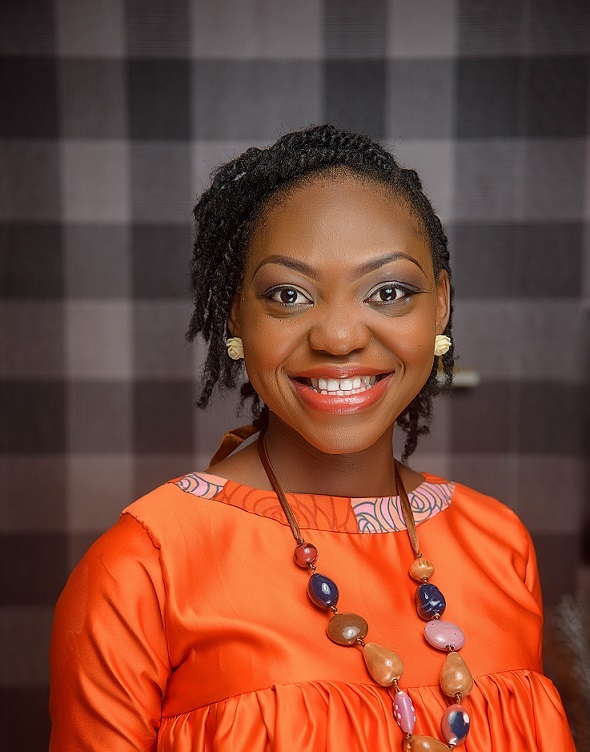 I'm Temi Ajibewa #TheMillionaireHousewife, the Founder of The Millionaire Housewife Academy. 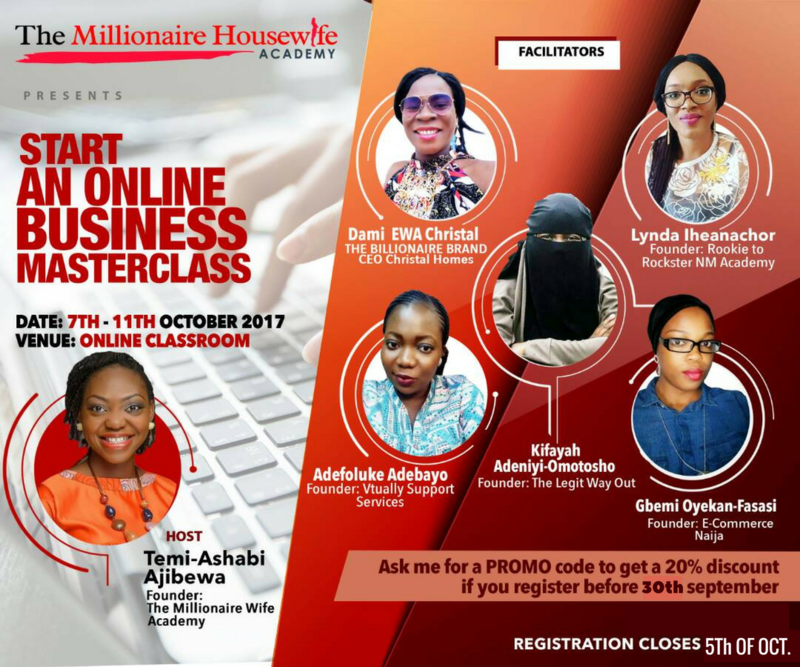 As an Online Business Coach, I help female professionals and entrepreneurs to start, grow and profit from their online businesses by taking advantage of opportunities around and within them, so that they can decide to be a millionaire housewife like me or not. 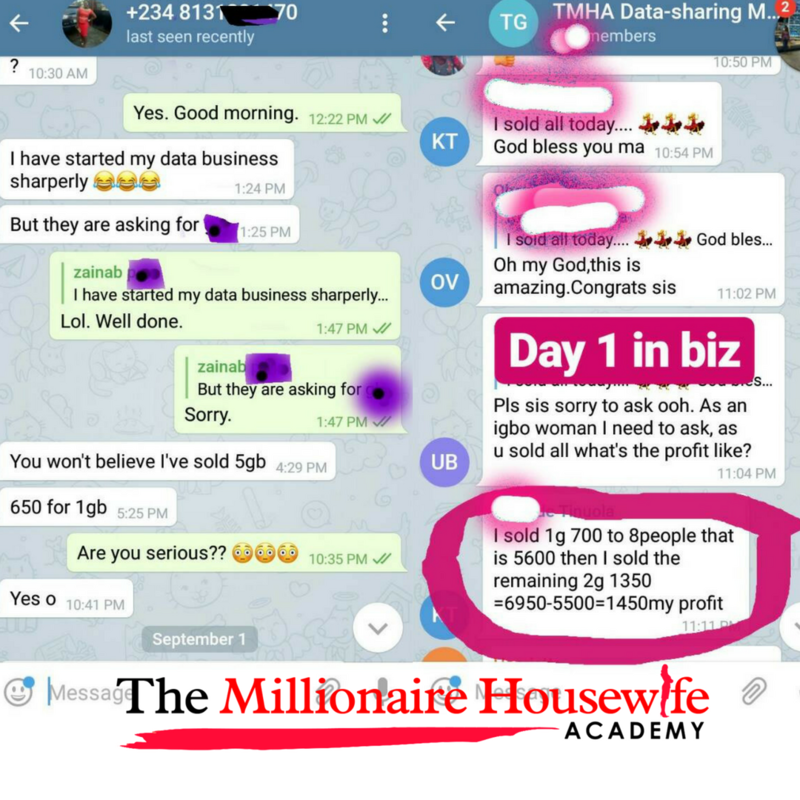 I've been a housewife for 4 years now and just about 3 years ago, I started running a profitable home business (the data sharing business) and making cool cash from the comfort of my home. 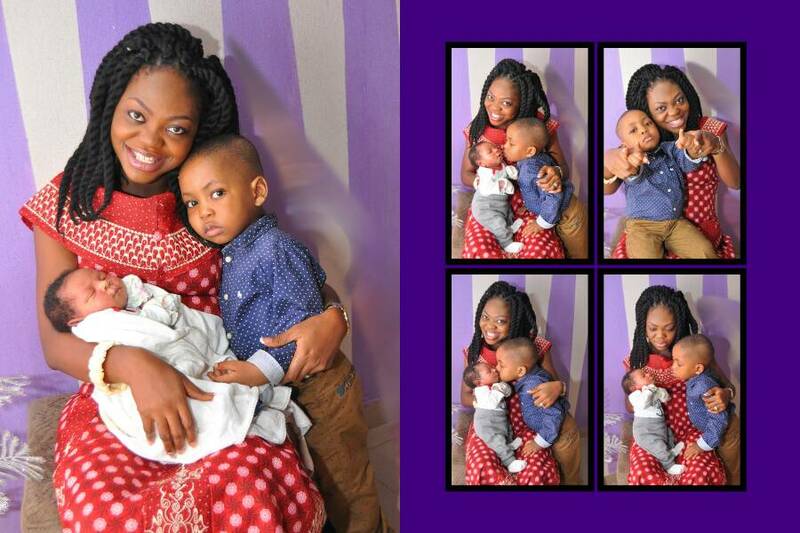 The data sharing business was my launch into the online business world and as we speak now, I have 7 online businesses from which I make 7 figures consistently all from the comfort of my home while I nurse my two boys. My desire is to help other women (especially housewives) to become financially empowered by starting a home business. If I can do this, I believe any woman who has a smart phone and access to the internet can also do it. If you are reading this, I know you can do this. Since I became a business coach, the most frequent question I've gotten is 'Temi, what business do I start?' To answer this question, I've written a book with the same title, created courses, mentored people and one thing was always constant in my answers, 'Find your passion and monetise it'. In spite of all these though, the question still persists. The same people who have read the book and taken the courses still ask the same question. They would usually say "Temi, what business do I start pending when my passion business will pick up or what do I do to have multiple streams of income?" It then dawned on me that people aren't at all the same. We don't all find our passions early or easily enough, come to think of it, even I have tried a whole lot of things before finally doing what I do now. Besides, apart from my passion business which is my business coaching, I still have several streams of income which actually contributes to my being #TheMillionaireHousewife. Some people require to be held by the hands and have opportunities that surround them pointed out to them, and some who don't exactly have these opportunities, have to create them. Our experiences, what we know or are exposed to is a major contributor to finding what we can do best and if we don't have the right ones to trigger that discovery, we may forever remain in the rut of poverty and helplessness. Therefore, it is my desire to empower more women towards starting and profiting from their own online businesses. Especially when they are yet to discover or begin making a living from their passions. So WHY am I REALLY doing this? I see a trend where women are becoming more financially dependent on their husbands thereby, unempowered to make salient decisions for themselves. The society has conditioned so many women into seeing men as a meal ticket and as their deliverance from the life of poverty they may have been born into. I see so many young women aspiring to marry, hoping to snag that rich prince charming who will come and take up their family expenses and give them a brand new life. I see some women take a sh*tload of maltreatment from their husbands simply because he's their only source of income. See, an empowered woman is an empowered nation and when a woman is empowered, she can train her children to become noble citizens of the country. This is more of a 'Ministry' vision for me to help the average, stuck Nigerian women to become unstuck, living a financially free life even from the comfort of their home. I'm also doing this for the professional women who are tired of the rat race in the corporate world and would rather build their own business but are unsure of where, how to start or how to break the cycle of being constantly broke. This will provide a side hustle option for them while they work on quitting the rat race. This class is me trying to shed more light on the opportunities available around and within us as women. Who said you can't earn more than your husband? Who said you can't pay the rent? Who exactly said you can't single-handedly arrange your family vacation? 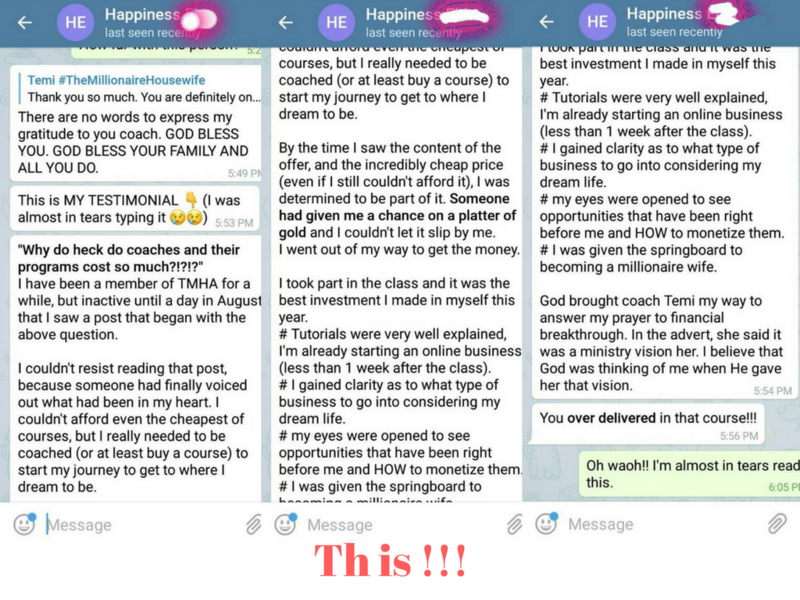 This is why I decided to rally up my Millionaire friends to mentor and train other women in practical businesses. Quality information on over 20 online businesses you can start from the comfort of your home. Live practical hands-on training on 6 businesses you can begin immediately. Tools and right strategies to starts your own online business. One month mentoring access to the facilitators in another closed group. Real estate: How you can sell properties in Lagos and make mad profit without leaving your house. 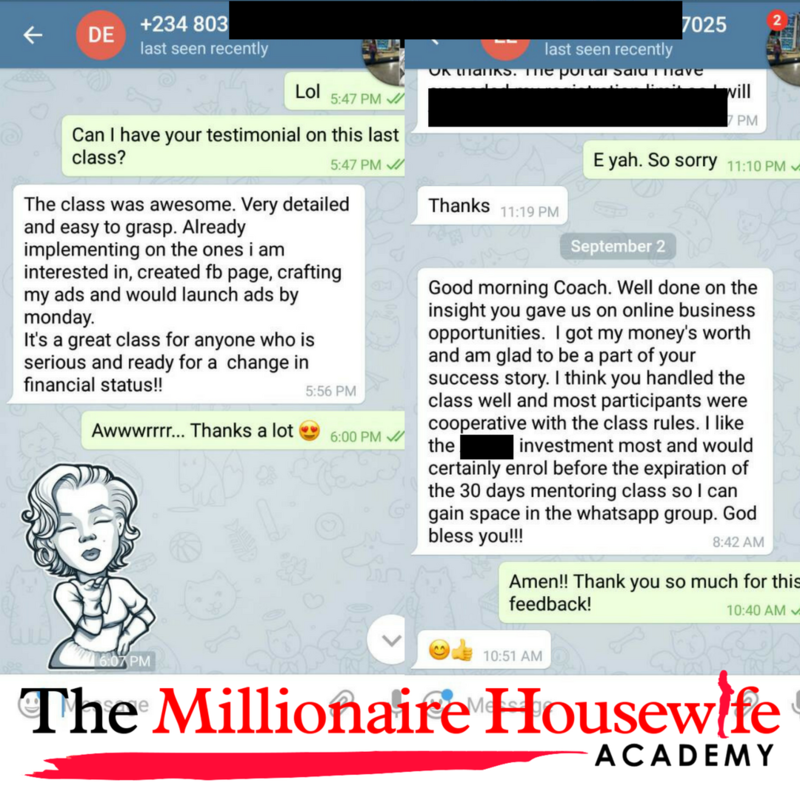 If you allow yourself to be mentored, you can even own your own estates like our trainer does in less than two years (at ₦50,000 value). 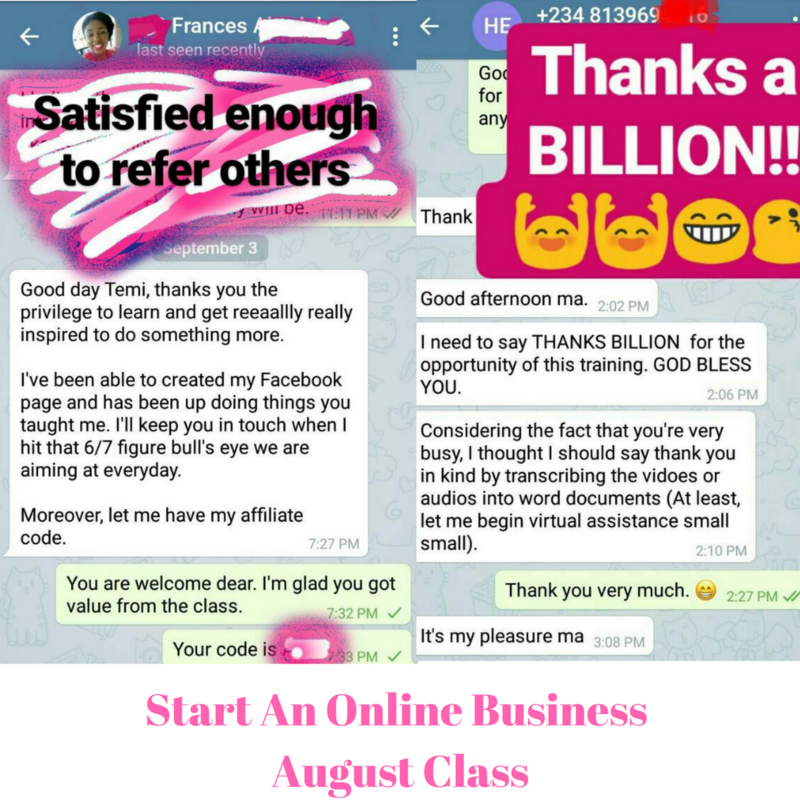 Online investments: There are over hundreds of them but our trainer will be taking you on the most reliable and scalable ones (Priceless). OK now I know you MUST be thinking Waoh Temi, this is really amazing! It must cost a fortune! You know what, you are right. This class is going to be amazing and really SHOULD cost a fortune. (I mean I taught data sharing only for ₦30,000 last year 2016 so giving all the other businesses you will be learning, it should cost you about ₦100,000 at a discount rate but you know what? This won't cost you ₦100,000 or even half of it. Not even the ₦30,000 you would have paid if you wanted to learn the data sharing business only. See, I'm not holding this class to make money off you. Yes, I WILL make some money (and I know you know I deserve to) but this is more of a 'ministry work' for me. This is me wanting to give you my very best just as God laid it on my heart so what you are paying is just for logistics. In fact, according to Kifayah, one of our trainers, this is more like #OperationEndPoverty. And I do agree with her because after this class, I know that poverty will not know your name again and neither will you ever be broke again IF you do all that you will be taught and follow all that you will shown. 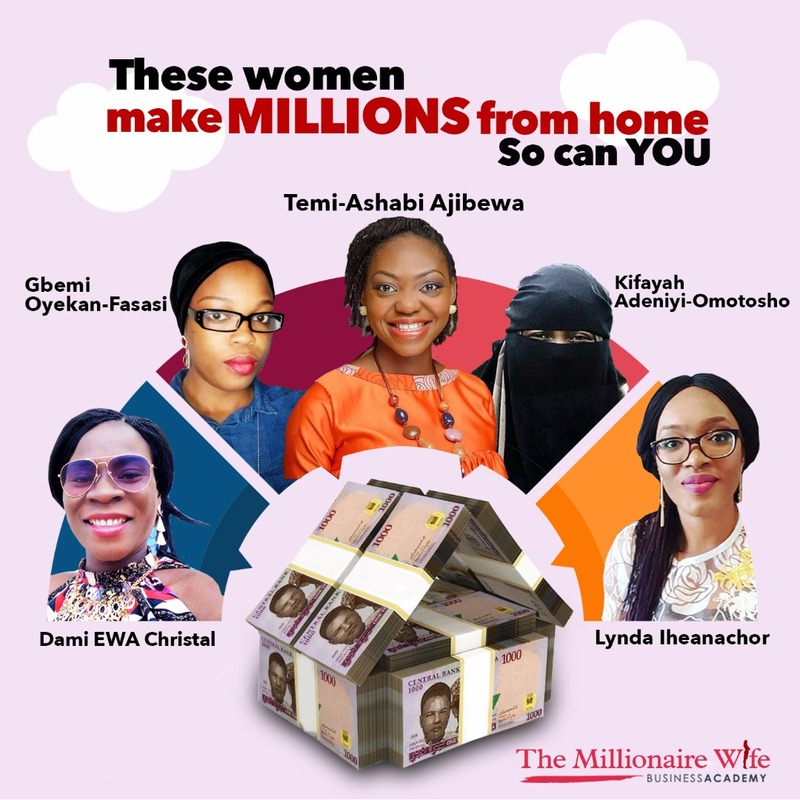 With just ₦18,500, you will be having access to these amazing business gurus who will teach you in a step by step process, online businesses you can do right in the comfort of your home and become a Millionaire Housewife in record time if you are DEDICATED. This PROMO CODE is valid only till 30th of September, 2017. Err... How can you trust that you will get value for your money? So now, there you have it. You have two choices going forward, proceed to register and lock in your spot to financial freedom or simply wrinkle your face as you close this page and continue on your own. Class starts 7th to 11th of October, 2017. After payment, send a Telegram message IMMEDIATELY to 08038633667 with your proof of payment (a picture of the bank teller or screenshots). N.B: ONLY PAYMENTS WITH PROMO CODES WILL BE ATTENDED TO. To get your Promo Code, ask the person who shared this link with you. Note again that all promo payments must have a Promo Code for it to be approved. If you're doing a bank transfer, use your code as the remark and if you're doing a cash deposit, make it the first word before your name in the Depositor's name. If you're unable to do this because you're using a mobile or ATM transfer, kindly send your proof of payment to the person who gave you the code in order to access the class. It's that simple. The class is holding online in a closed Telegram group. So time and location is not a barrier at all. Telegram? How does it work and how do I get it, please? Please explain, how exactly will the class hold? 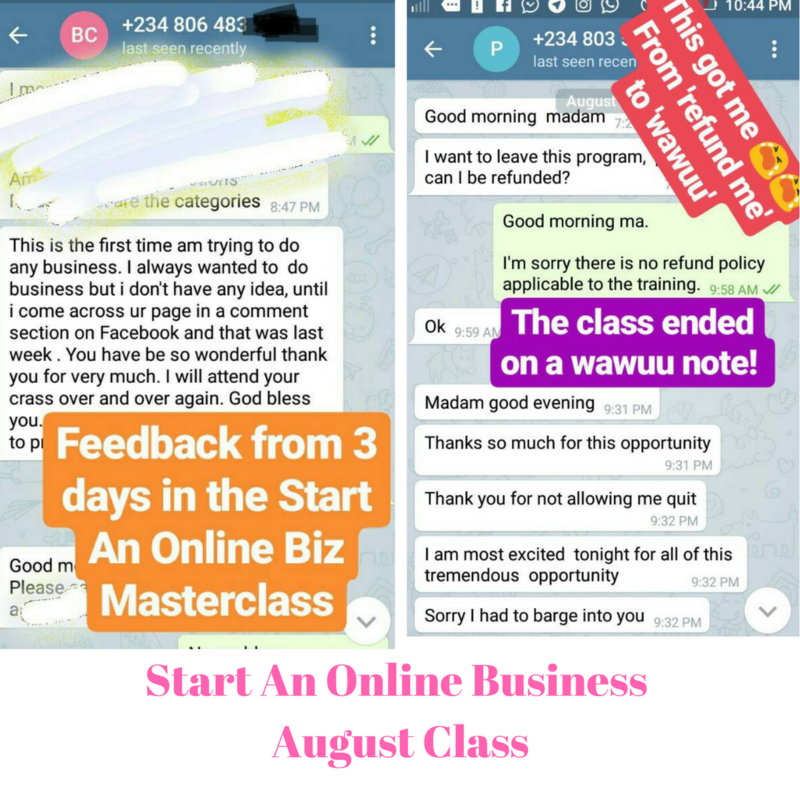 Like I said, the class will hold online in a closed Telegram group which is just like WhatsApp group. Daily before 12pm, for the 5 days, you will be getting videos/audios and their transcriptions in PDF documents containing the lessons of the day. You are to study them and drop your observations or questions STRICTLY between 5pm and 7pm daily. The facilitators will then take all questions after then. After the whole class, you will be divided into smaller subgroups according to the business type you want to start immediately for effective mentoring for 30 days only. Yes, you can join more than one group but not more than two so you don't overwhelm yourself. These groups will remain even after the class as a support group to all participants. Am I paying 18,500 to learn each of the business types? No. Even though it will be totally worth it. The registration fee you are paying covers all the business types you will be learning. I'm unable to join this at the moment, when will the next class be please? This is not a class you want to miss if you think you need this now. To start the real estate, arbitrage and virtual assistance businesses, you do not need any capital to start. All you will be needing is your internet-enabled device and a mind that is ready to put in the work in order to succeed. But if you do not have a good Android phone and cannot afford data to stay online 24/7, you will need to invest in one or else this class is not for you. However, to start drop-shipping and the data-sharing business, you will need a minimum capital of N5,500 for you to get started. On the various online investments you will be shown, you will need between N2,000 and N400,000 to start investing. You can start any of the businesses immediately without wasting time. 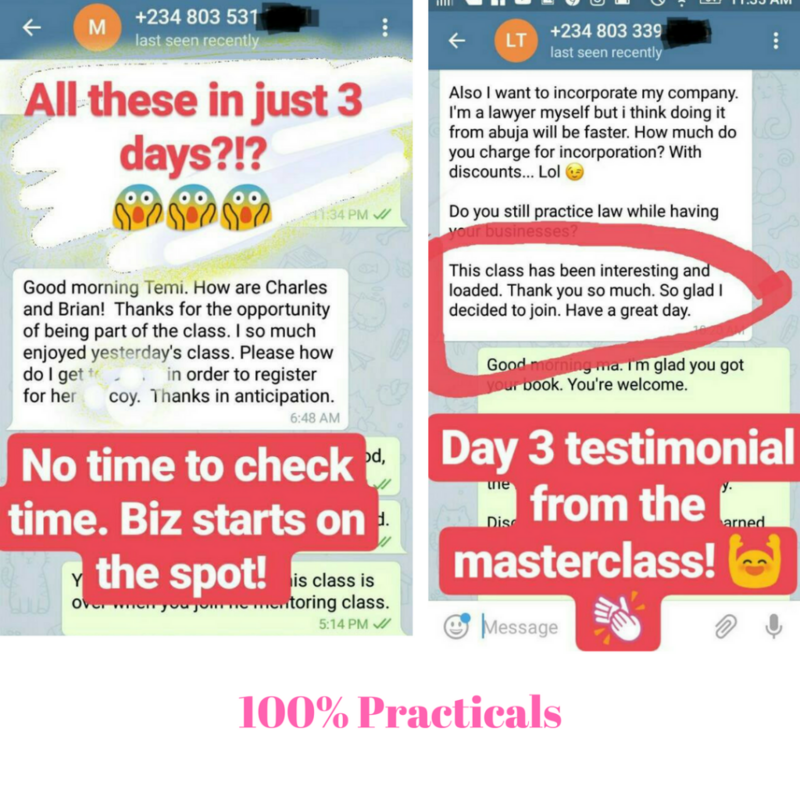 You will not need extra training before you can start unless learn more on how to be an expert seller the way we are all learning to be everyday. Of course, so far you joined the class as a millionaire. LOL. My sister, it is an empowerment programme but you have to start by empowering yourself first. You paying for the class shows that you are truly ready to make something out of it. According to my Yoruba people, "Èyìn àrò ni oògùn tí a à bá fi owó se ñgbé" which in simple English means, you don't pay attention to what you've not paid for. I hold free trainings every now and then in my Facebook group. To get access to my free training, join over 11,000 women on my Facebook group here. This one is a dedicated class and besides, I'm also inviting facilitators who will give their time and hard-earned knowledge. Trust me, none of us got what we will be sharing with you for free. Still have more questions? Please get in touch with the person who gave you this link.